Born a genius; education, wealth, and prestige came easy to Logan Richards. Actually, there wasn’t much that Logan couldn’t learn or acquire. However, he knew there was more to life than money and power. Logan was determined to find the woman who he'd dreamed of his entire life and know what it was like to love her before he died. Amber Lewis, a waitress for a five-star restaurant in, Dana Point, California, was overworked, stressed, and wary of life since her sister, Heather, had passed away. Then, one evening while working she fell hopelessly in love with Logan Richards, a chivalrous man who felt deeply familiar. For Amber, it was the beginning of a voyage of self-discovery and renewal. For Logan, it was the completion of life. For each of them it was the deepest sort of love. 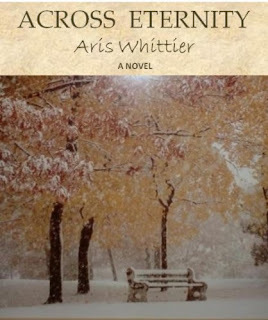 I feel extremely lucky that Aris Whittier asked me to review her book Across Eternity, and that I had a chance to read this amazing book. As soon as I read the summary, I was sold immediately and once I started reading I couldn't put it down. This book is about love, love, love, love! Eternal and unconditional love. Logan has spent all his life looking for the woman he could only dream about when he was young. Now, he finally finds her in Amber, a waiter in a five-star restaurant. Amber imediattely falls for Logan, all the while feeling like she've known him all her life in some deep subconscious level. She doesn't hesitate to embark on a journey with him, where they discover that the love they felt, feel and will feel for each other is forever. Across Eternity is such a beautiful and emotional book! It's not a question of whether I liked the plot or the characters because there really was nothing NOT to like! I loved both Logan and Amber. Logan is a man that has been through a lot in his life and it shows. Granted, he was super smart (college at 13) and very very rich, but you could tell that none of that filled the void in his life and in his heart. And the,what seems,eternal search for his soulmate, has worn him down a lot. It was worth it though, because when he finds Amber, he feels alive again. Amber has some baggage of her own. Having gone through the tragedy of her sister's untimely death, she struggles to find something in her life that will give her the hope and the strength she needs to go on. Then she finds Logan, someone that loves her truly, deeply and unconditionally and she just can't believe how lucky she is. I loved Across Eternity, it's story and the message that it gets across. Never has a book made me cry. Even if I said so in my previous reviews, don't believe me! Because I didn't know what crying was until I read Across Eternity. And that's all I'm gonna leave you with. Despite how sad you feel by the end of the book though, I believe that what the reader should learn/gain from Across Eternity is optimism, hopefulness and encouragement to do anything they want in life because they simply can, and to enjoy it to the fullest. If you are contemporary romance fans, read Across Eternity now! if you aren't, read it anyway. It's that good!